I have a distaste for Blockbuster. I'm not a big fan of over-paying for something I don't get to reap the benefits of for more than an hour or two (hence my usual avoidance of movie theaters as well). Although, come to think of it, I'm hypocritical here, because I apparently have no problem eating out at restaurants...Anyway, I'd always walked right past the Red Box DVD rental machine at Stop 'n Shop. But last week I stopped just to see what it was all about and discovered that you can rent DVDs there for $1 a day. I figured this was a fee we could put up with. So to try it out, Meghan and I rented Click, with Adam Sandler, on advice from Mike Lyle (thanks, Mike). Mike said he had cried when watching it. The combination of Adam Sandler and Mike Lyle in tears was enough to intrigue us. It's not a great movie. I'd love to use it as an illustration some time, but there's needless sexual humor that many might not be able to stomach. There's also some pretty funny stuff you'd expect from Adam Sandler. You'll not see many awards for this one. But it did indeed make me emotional at the end, and it left me pondering things I've been considering recently. The movie picks apart what I believe is a major deteriorating factor of our American society. The premise of the movie ends up being "family first, work second." But I want to carry it a bit further. 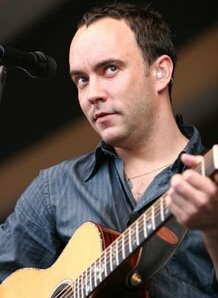 Once upon a time, I was a rather intense Dave Matthews Band fan. I went to my first concert a few weeks after I got my driver's license when I was 16. I was bobbing to "Too Much" and "Ants Marching" well before DMB took off in popularity like they did in my high school and college years. I actually abandoned listening to them on a spiritual conviction binge my freshman year of college (an action that was helpful at the time, but has since been rescinded). Anyway, yesterday as Meghan and I were driving to our latest ultrasound appointment (by the way, the fluid levels are better), DMB's song "Tripping Billies" came on the radio. I remember when my friend Spen and I first starting listening to DMB, the week after Crash (probably still in my top three "most listened albums" and top ten "best albums") came out, he asked me what I thought about the song. I didn't really know. I mean, I knew what it meant, but I didn't really care. I just liked the way the song sounded. The premise of the song is: "eat, drink, and be merry for tomorrow we die". The general American societal response to this is: "work hard then be merry," with the usual result that life is full of work and little merry-making. The general evangelical Christian response to this premise is: work hard for time is of the devil and Jesus might be coming back soon. Anyway, as we listened to the song yesterday, I was reminded of a statement I heard Jon Middendorf make several weeks ago - "[The Church needs] to count less and party more." He was speaking in terms of measuring church "success". I've looked a bit at scripture since then, and though Paul appears to think we should be working hard, Jesus takes a more relaxed role in the Kingdom. He often took the time to slow down. His first sign in John was to create a better celebratory atmosphere at the opportunity of a wedding. The last thing he did with his followers was sit down to a meal. And he has us re-member His Body in the act of a meal. I mean, he could of had us re-member remember the cross with the use of hammer and nails or the carrying of a cross. But he didn't. He chose the intaking of bread and wine. Meghan, Brayden, and I spend a lot of time together. I admit that often I feel guilty that I'm not doing enough for the church or that I am missing out on something I should be doing at the office. But truly, I love the fact that we spend a lot of time together. We love to eat. Meghan loves to cook and I love to eat her cooking. Brayden loves to lay on my stomach facing the ceiling and throwing a ball up and down over and over again. After Brayden goes to bed, I love sitting in the same room as Meghan while she reads and I browse the Internet. This past Sunday evening the a bunch of us from North Street went out Christmas caroling around the immediate neighborhood. After we sang together for almost two hours, we gathered back at our house for food and warm drinks. It was a lot of fun and I think the Kingdom is better for it. I don't know, I guess I just wonder how much of the administrative tasks of life truly add to the Kingdom instead of taking away from the essence of the Kingdom. Life in the Kingdom is an incredible thing - we know that we get to live because of Christ. I think that's reason for celebration. The concept of "eat, drink, & be merry" is indeed in scripture (see Luke 12:13-48, but take care to read the whole passage). Jesus tells a story about a rich guy who has a ton of crops, and not sure what to do with them, decides to store them up and milk their benefits for the rest of his life. So he tears down his barns and builds bigger ones to store more for a longer period of time. But God tells him that his life is over as of that day, so what good was his storage? Christ's conclusion: so it is with those who store up treasures on earth rather than being "rich toward God." And then there's a "therefore." Jesus tells the disciples that they shouldn't worry so much about what to wear or what to eat, "For life is more than food, and the body more than clothing." So don't strive for the things of the earth, but strive for the Kingdom...and even then, the things of the earth will be there for you. Thank you ... I appreciated your reflections! Merry Christmas! May this season be filled with joy and unexpected blessings in the life of your family. glad to hear about the fluid deal being resolved, i've been praying about that. great reflections. sometimes i think i don't party even when the party is on! martha type i can tend to be when im in charge of the party. maybe i need to realize that i'm less 'in charge' of the parties than i think i am. had lunch with beth j yesterday. good kid. thanks to you and your community for caring for her.